The emphasis on collaborative management of children's health has led to the involvement of multiple disciplines in pediatric health care. This shift has resulted in an increasing focus on the assessment of children's functioning across multiple domains. The Task Force on Pediatric Education (1978) noted several decades ago that the types of children's health problems that are reported in pediatric settings include developmental, behavioral, psychological, and educational difficulties, as well as those related to their physical health. While attention to assessment issues in behavioral pediatrics has historically lagged behind that given to intervention and treatment, the field has reached a point in its maturity where numerous measures are available for the assessment of infants, children, and adolescents. The goal of this volume is to provide a single source reference to key screening instruments for clinicians and researchers who work with pediatric populations. Practitioners with a variety of backgrounds, including physicians, social workers, nurses, and psychologists, are increasingly using standardized measures and should find this book useful in selecting an appropriate screening tool. The volume is also intended to serve as a comprehensive guide for study instrumentation for researchers. Although other overviews of assessment measures are available, they tend to be more circumscribed in nature (i.e., overviews of family assessment measures) and do not cover the full range of areas that child health care professionals may need to assess. 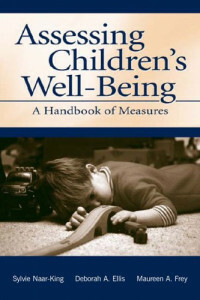 The areas targeted by this volume were chosen to cover the range of assessment issues faced by child health clinicians and researchers, including health status and quality of life, adherence to medical regimen, pain, development, behavior, children's coping and cognitions, family functioning, and consumer satisfaction. Each chapter begins with an expert overview of the theoretical construct being measured, and any special concerns. Following the overview, key measures are reviewed. It should be noted that only quantitative measures with some evidence of adequate psychometric properties were considered for inclusion in the volume; qualitative measures and those with minimal data regarding psychometrics were not presented. In general, Mash and Terdal's (1990) criteria for judging the utility of behavioral pediatric measures guided the selection of measures for inclusion. They recommend that measures should be appropriate for use in health care settings, have both a health and a systems orientation, have a developmental perspective, and be effective, time efficient, and economical. Finally, assessment tools were required to be general enough to be appropriate for both the general pediatric and chronically ill populations. Although disease-specific measures are not reviewed in detail, a reference table of available disease-specific measures is included at the end of applicable chapters. The review of each measure is organized in the following format. First, the key reference and information on how to obtain the measure are provided. Second, a general statement about the purpose of the measure and a more detailed description of the measure are presented. A discussion of any standardization procedures, normative data, or at a minimum a description of the sample used during instrument development follows. The difference between a bad programmer and a good programmer is understanding. That is, bad programmers don’t understand what they are doing, and good programmers do. Believe it or not, it really is that simple.